How on earth do buildings stay up? Wind, rain, rust, even jumping while dancing on them and they still refuses to give? 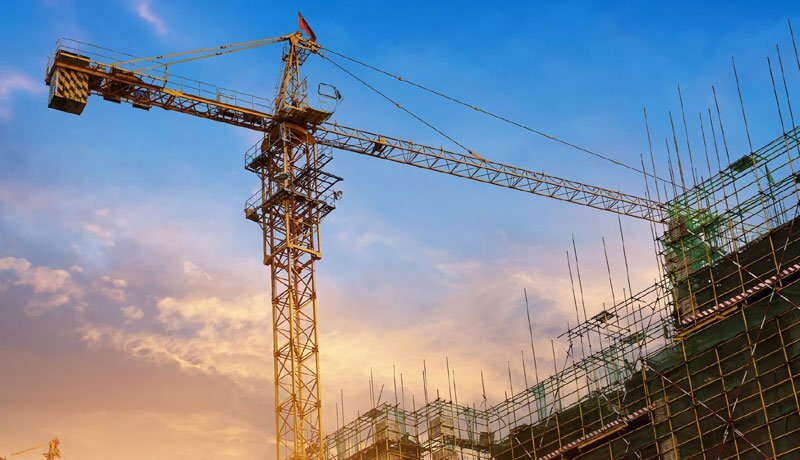 Buildings are fundamentally constructed by placing columns, floors and roofs atop a foundation all of which are typically made of concrete, wood, stone, brick, steel, etc. even ruble and mud! To begin with buildings sit atop a foundation. Foundations are typically found below the basements of our houses or apartment buildings but can also be a flat slab of concrete, be on stilts or anything in between! Think of them as your feet: It has to be strong enough to hold your entire body while not occupying too much “foot print”. On top of the foundation you begin laying your columns. Columns hold the floors and roofs that sit on top of of them . Think of them as your legs. They connect the foundation to the rest of the building (in this case your body -floors and your shoulders and head-the building’s roof). Then you lay your floors on top of your columns. You can cover floors with an infinite array of finishes including tile, wood, marble, etc. Think of the floors as your torso from your hips to your neck. Lastly your roof. They come in all shapes and types from flat to pitched, from curved to slanted. These shapes are chosen for aesthetics, functional, energy efficiency, climate and other considerations. Think of the roof as your head. Compression: Think of a typical image of a person carrying a bucket of water over their heads. What does that do to your body? Will your neck hurt? Will your back be strong enough to stand the weight without snapping? Tension: Think of a kid on a monkey bar. How are your shoulders able to prevent your arms to separate from your torso? Bending: Think of your child sitting on your lap. Why doesn’t your femur bone snap? Sheer: Think of a runners hip. The leg that is on the ground is carrying the weight of his entire body while his other hip is pushing the other leg up in the opposite direction. Torsion: Think of a person turning a door handle. You need to achieve this without your elbow or wrist separating from the rest of your arm. Compression: how much weight can a floor, column or foundation carry? can the roof stand the weight of a 12 inch snow storm? Tension: how flexible is the floor we are standing on? If we load it with a Jacuzzi tub full of water weighing over 1000 pounds can the floor “stretch sideways”? Bending: If a building houses a dance hall and 100 people each weighing in at 150 lbs each all jumping in unison will the floor snap or will it flex enough and bounce back? How much “give” can it withstand? Sheer:Think of a 100-story building in a tsunami-prone area. 150 mph east winds are hitting the top of the building western wall while a 20 story-tall wave hits the building’s western wall. Will it snap in 2? Torsion: the wind hits the same building on the top west corner at a 90-degree angle while wave hits it at the bottom east corner in the opposite 90 degree angle. If this image is not clear then think of someone using their hands to wring a wet rage dry. Contrary to popular belief buildings are not rigid or else they would be so brittle that they might snap on a windy day. On the contrary: they are flexible enough to take that wind, flex with it and then return to its original position. As a matter of fact 100-story steel buildings might sway as much at 10 feet at the top. You can tell by staring at the toilet bowl on a windy day and seeing water “dance around” in a circle. The key to this flexibility is how fast it snaps back and wether this snap is comfortable for users and safe enough for building systems such as elevators not to come of their car guide rails and fall to the ground. Of course there are many other concerns in keeping a building standing including materiel considerations such as strength, stress, strain; deflection; ultimate use and loading; motion issues such as vibration and earthquakes,; temperature and ambient considerations such as heat and humidity and many more.